An old gas guzzling, dirty, white/cream 1970 Ford Falcon Coupe cruises northbound on I-678 in Jamaica, Queens. In the front seat are two young fellas – both wearing cheap black suits with thin black ties. Their names are Little Bobo and Lawman. Lawman is behind the wheel. Lawman: Okay now, tell me about the trip. Little Bobo: Well, what do you want to know? Lawman: Well, tell me about the food you had there. It was good, right? Little Bobo: Oh man! You woulda dug it! Between London, Newcastle and Edinburgh, food was fantastic all around. Little Bobo: But you know what the funniest thing about the UK is? Little Bobo: It's the little differences. I mean they got a lot of the same stuff we got here... but there it's a little different. 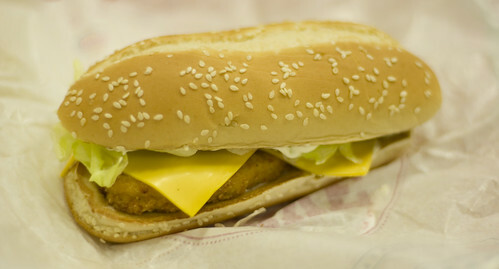 Little Bobo: Well, in the UK you can go into Burger King and get an Original Chicken Sandwich with Cheese... except they don't call it that. Lawman: They don't call it an Original Chicken Sandwich with Cheese? Lawman: What'd they call it? Little Bobo: Royale with Cheese. STILL IMAGE – ROYALE WITH CHEESE. Let's roll back a few pages earlier in the script. Day 1 of the Journey was filled with sight seeing, exploring, milkbars, and a football game. By 10 PM my fellow traveler and I were becoming a bit hungry and tired. To add to the situation, most the eateries in the area we were staying in were closed. Now, a pub would have been an obvious alternative. Many pubs have kitchens, kitchens that stay open late. However, we lacked the energy to enter a pub. And there it was. Burger King. Right by the tube station in King's Cross. Food at last! I began to think, "I wonder what they have on the menu that is different." The menu was more or less the same. The differences being the Vege Bean Burger, and the Piri Piri Chicken Sandwich... and the ROYALE WITH CHEESE! Ok, so the only difference is the name... but I mean come on. Pretty sweet right? 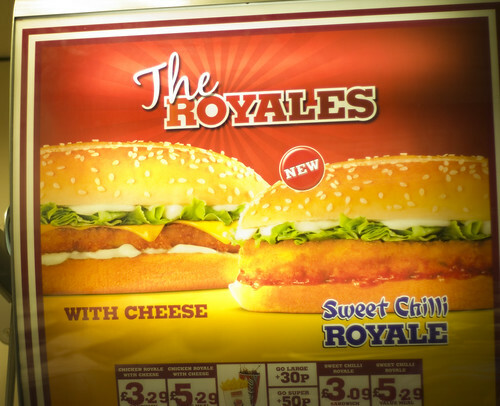 You could also get your Royale with Cheese in a sweet chili style. Try getting an Original Chicken Sandwich with Cheese AND sweet chili sauce in the states. Yeah, that's what I thought, can't have it your way... can you? Only in the UK.